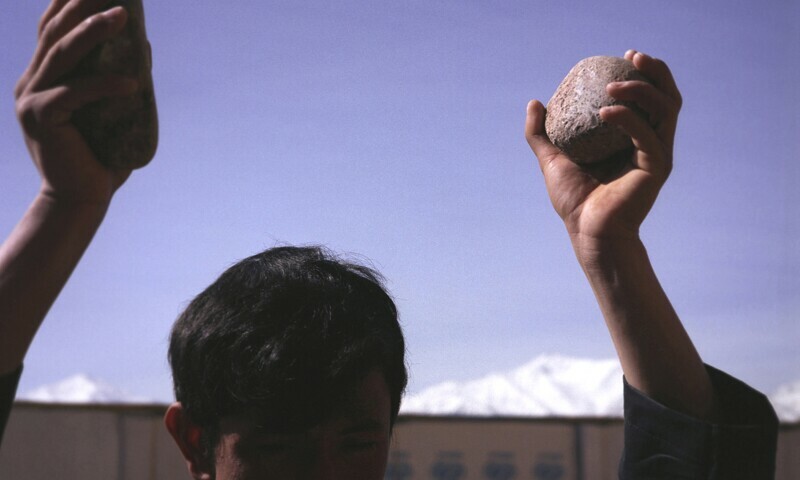 Lida Abdul, still of Clapping With Stones, 2005. 16mm film transferred to DVD; 5min. A powerful meditation on non-conformity and resistance, the exhibition examines social, cultural and political events through a local and global lens, offering unique perspectives from 10 contemporary artists living and working in the United States and internationally — all of whom are grouped together for the first time in a museum setting. Featuring works in a range of sizes and media — including photography, sculpture, video, textile, and installation — “Clapping with Stones” uses the Rubin’s historic circular architectural details to create an immersive site-specific display. “Clapping with Stones” features works from Lida Abdul; Kader Attia; Nadia Kaabi-Linke; Naiza Khan; Kimsooja; Pallavi Paul; Shahpour Pouyan; Ibrahim Quraishi; Nari Ward; and Hank Willis Thomas.